It must be pie season as pie questions have reached a critical mass level in my Inbox over the last two weeks. Some questions are random requests but one in particular has been repeated. Yes, like many things we do in the kitchen, some don’t seem to have a purpose; seeming more like a waste of time. And during the holiday season, we are all in a hurry…waiting an hour for pie dough to chill feels like a time warp, especially since we have to wait 10 minutes after the chilling process to make it pliable enough to roll out again! Well, believe it or not, there is reason to chill the dough, and the reasons are important for maintaining that flaky crust we all look forward to eating. It all has to do with gluten and moisture. By chilling the dough before rolling it out, we allow the present gluten strands time to settle down and relax. 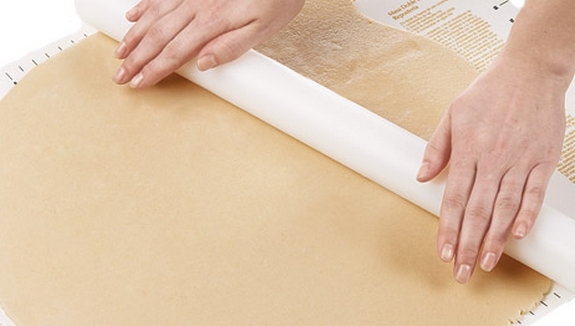 This actually makes your pastry dough easier to roll out and cuts down on any shrinking during the baking process. Chilling also lets the available moisture find its way back into all parts of the dough. Something that is hard to achieve while you are mixing the dough together. Overall, letting the dough rest in the fridge for one hour before rolling it out is a win-win situation with a purpose. So happy pie baking and make sure to give your dough the time it needs. Chilling the dough also helps the fats in the dough re-solidify, which prevents the gluten from sticking together in one big clump. Rather (if you use the right mixture of fats) you’ll get flat sheets of fat (that make layers and thus flakes) and little balls of fat (that make melt sooner and coat the grains of flour, tender). Remember, the harder you mix dough the more likely you are to make gluten, which is tough and elastic. That’s great for chewy bread, but bad for tender/flaky pie crust. Thanks so much for this – I’ve always wondered. I have very rarely refrigerated the dough and you know what… I have always had poor results when baking a single crust for my cream pies… the dough shrinks every time. Hopefully next time the shell will keep its walls. That’s right and mixing warms up the fats, which makes the fat melt…reducing the flakiness. Yes, 1 hour in the fridge is good. Live and learn…I had no idea that’s why you should chill dough. lovely photoâ€¦your dough looks magnificent! i do know why we chill dough but, mine never really works out well after chilling. i am going to give it another try! Wow, now I know what I’ve been doing wrong. Easy for you to say. I am still buying my crusts already made. ~sigh~ I love your upside down apple pie recipe, but I still used the bought pie crusts. It is interesting, though, to know the technical reason why you chill pie dough. Is that a Matfer rolling pin you’re using? If so, do you prefer it over a wood pin? I’ve been contemplating purchasing one and wondered what a really good cook (like you!) thinks of it. Thanks! Thanks for this! My recipe says to chill the pie crust overnight and that’s not going to happen! I can let it chill for an hour or two though. Thanks! It is nice to know the “why”! Thank you. I thought I had heard this made a good pie crust great. I’m making my husband a birthday peach pie and want it to be extra special. I really appreciated the explanation. I’m going to add your website to my home page!!! With homemade gluten-free pie crust, refrigeration works wonders to the taste as well. It’s using brown rice flour, tapioca, and potato starch, so it must be moisture evening and fat solidifying. I make the coconut oil a liquid to start out the mixing, so probably back as a solid it can spread out better than I mixed. I’ve been making pies all of my adult life and just learned about chilling the dough. Today I’m giving it a try and hoping for excellent results. Thank you for the detailed explanation why it is such a good idea. Thanks for the tip on chilling the dough. Never have done that. Another key to flaky crust is to not work the dough very much after mixed and don’t use extra flour! The best results come when I make sure the flour and shortening are cut in well together but only with a hand held pastry cutter. Make sure you don’t add too much water or flour. I found an easy way to roll out dough was to take 2 heavier sheets of plastic cut out from a ziplock 2.5 gal bag. I tape one plastic sheet to the counter or table & place the ball of dough on it and then place the other sheet over the top and roll out. No dough sticking to my rolling pin. Then you peal off the top and put on your pie plate. Everyone asks for my pies. I can’t say I make anything else as good for Thanksgiving but I look forward to those pies! In fact I want all kinds and have a hard time selecting just a few.